Over this past year, I have become a big fan of juicing. 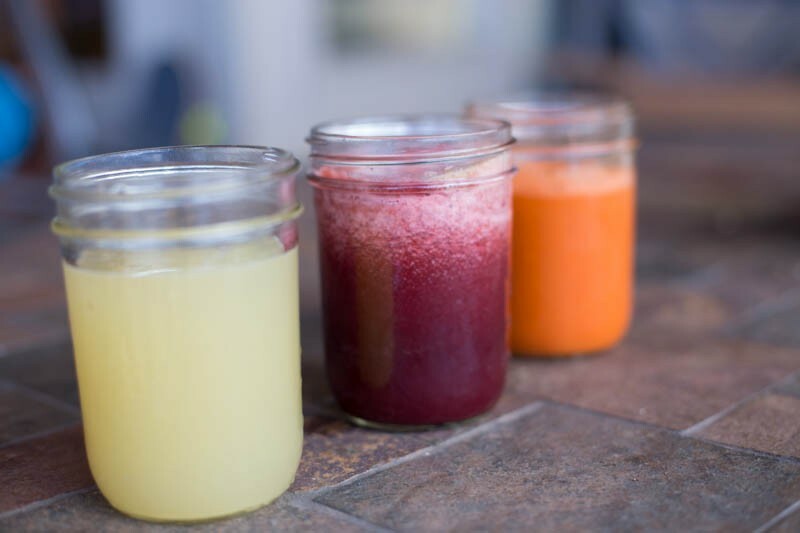 I used to be a pure smoothie person, knowing that using a blender (or my favorite–the vita-mixer) was the best way to keep the fiber and avoid the sugar spike that pure juices can give you. I might have been a bit of a smoothie-snob. 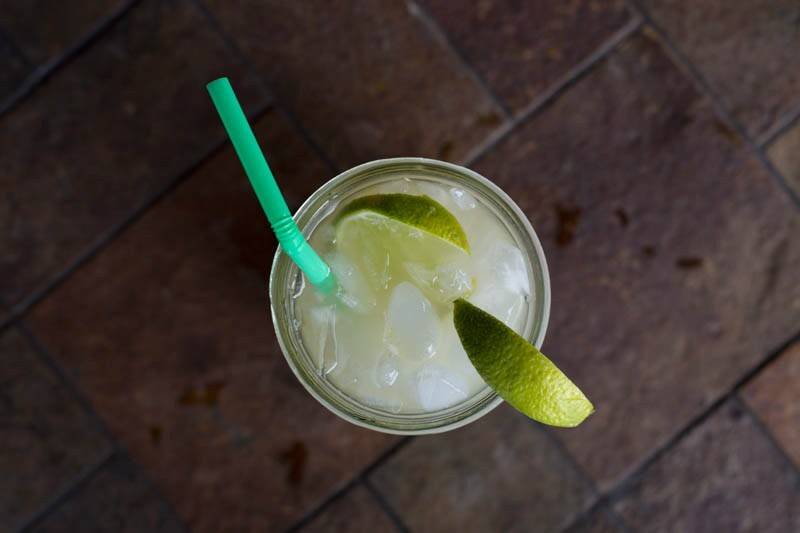 But with all of the tropical fruit that we grow, I was striking out on blending some things…and I finally realized that some things are just better juiced! 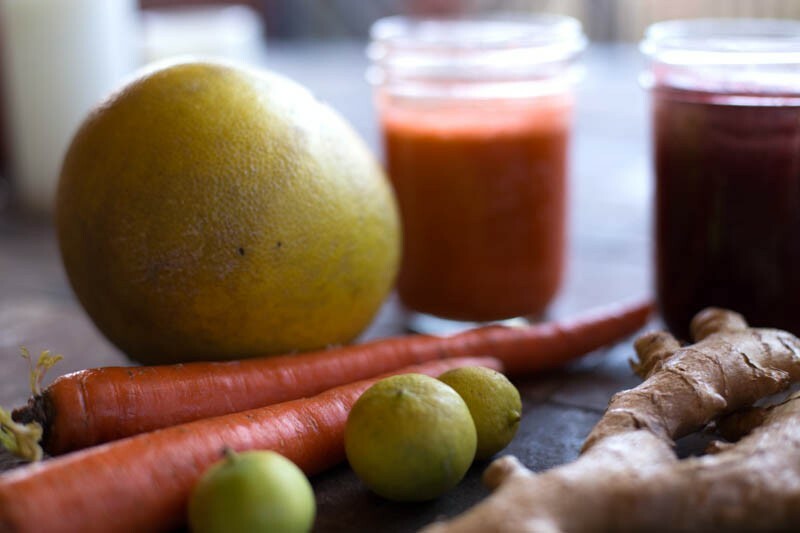 My favorite things to juice: Carrots, apples, beets, pomelos (large star fruit that we grow,) and starfruit. Anything that is too fibrous or grainy to taste good in a smoothie. 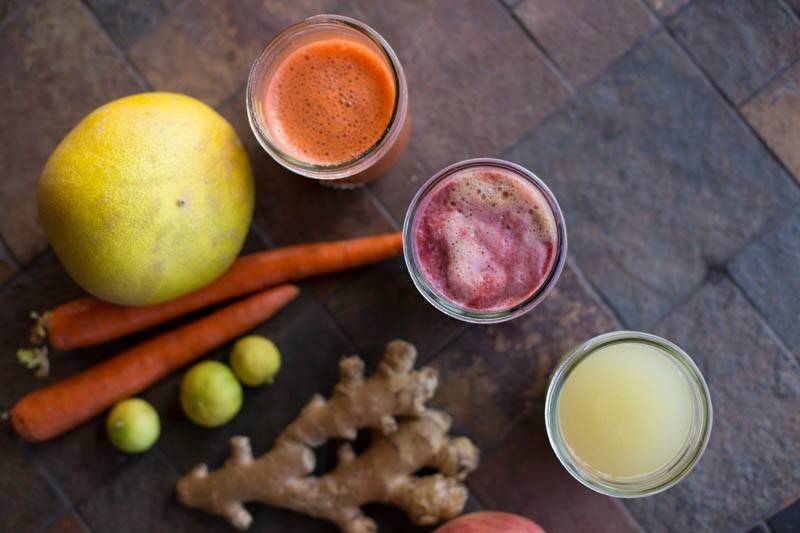 This time of the year there are so many good citrus fruits available that are so good for fighting colds and flus–it’s a great time to be juicing! Our latest obsession? 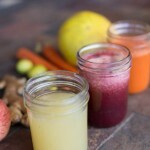 Juicing GINGER! This winter, Dave and I have been on a big ginger kick. You might remember back in November, when I wrote about how I was being a big baby because I had my first head cold in years?…and how I tried a ginger tonic from our local coffee shop…and how that led to my love affair with ginger…and then I made that baked gingerbread oatmeal? Well the ginger obsession just didn’t go away. One thing led to another, until a few weeks ago I found myself standing in my kitchen with a Costco supply of Hawaiian ginger, some lemons off our tree, honey, and the juicer. And it totally worked. Like magic. Dave and I have been drinking hot ginger tonic, morning noon and night. I keep it in a Mason jar to give it a good shake shake shake before I pour. We just give it a quick heat up in the microwave, but you could also warm it up on the stovetop. It’s equally amazing on crushed ice, but since it’s (brrrr 58 degrees!) 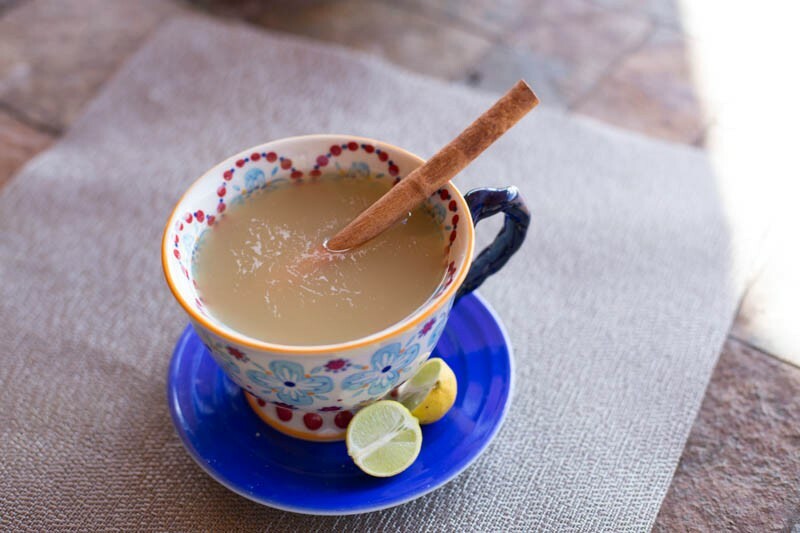 winter here at night, we love the soothing warmth of the warm tonic these days. And if you’ve got any kind of cold or sore throat, you’ll find this the most soothing drink in the world! Find the printable recipe below! PS> side note: IF you don’t have a juicer, you can make an easy ginger tea by placing a one-inch piece of ginger root in a pot of hot water with a cinnamon stick for about ten minutes. Sweeten to taste and you’ll love it! Clean and remove skin (optional) from a 4-6 inch piece of ginger and follow juicer directions to juice it. 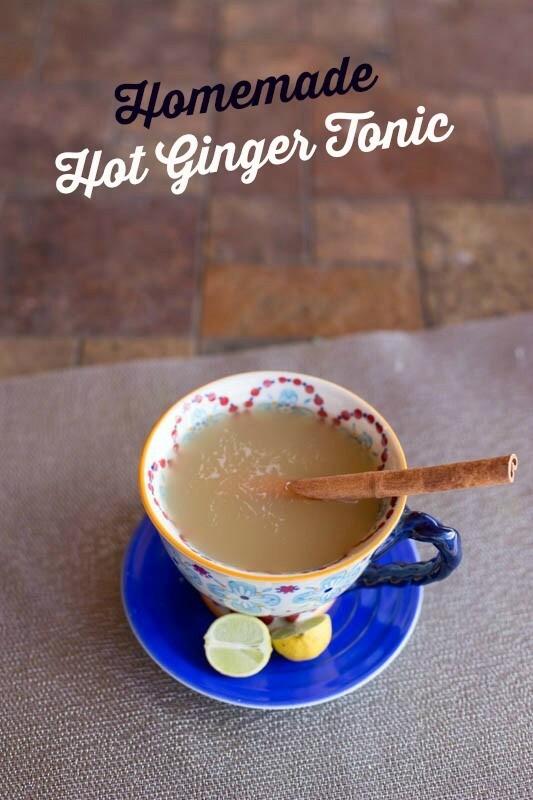 Note: Best to start with less ginger and honey and then add more to taste after it is combined. Just a reminder, in case you need more convincing…. Health benefits of ginger!? 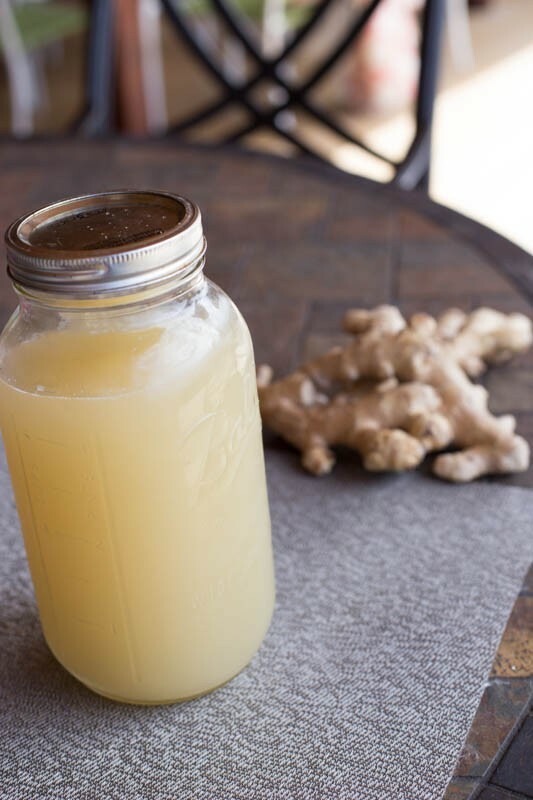 WebMD suggests that ginger is beneficial for all kinds of stomach issues, as an anti-inflammatory, pain-reducer, and more. Ginger has been used for at least 2000 years around the world for both medicinal and cooking. I got to read this when you recently reposted it. I love the Ginger Tonic. It’s delish! And perfect as we head into cold season here in the Pacific Northwest. Yummo! These look absolutely delicious! great recipe, absolutely delicious and easy to make. Thanks for posting it on here. I made your ginger tonic today and added some juiced turmeric. Delicious! Thanks so much for sharing your life and ideas with us. Please continue — I look forward to reading more! I LOVE ginger too!!! So glad I met you today:) I’m making your ginger tonic tea right now. 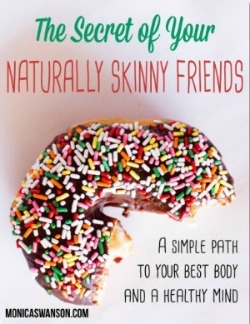 Exactly what my body needs, thank you so much for sharing. 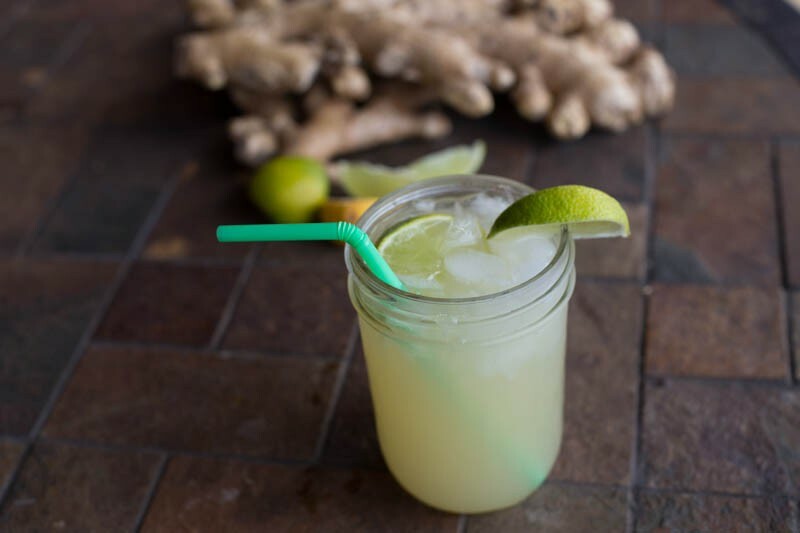 One of my favorite ginger drinks is juicing a whole pineapple & a ginger & pouring it over ice…love the zing ginger adds to everything! I don’t own a juicer and used a garlic press to express the juice from the root after peeling it. good idea. I grate the ginger and squeeze it through a piece of think cloth. I use the ginger juice for one thing and dry the grated ginger for tea. good idea. I grate the ginger and squeeze it through a piece of thin cloth. I use the ginger juice for one thing and dry the grated ginger for tea. I’m so happy you posted the recipe for the ginger tonic! When you did your november write up about it I was hoping to find a recipe for it. I did make your baked ginger oatmeal and the family loves it! (My dad called it lumber jack cake.) anyway thanks for the tonic recipe I’m super excited bc I love ginger! I’ll have to try that tonic! Hi Monica! 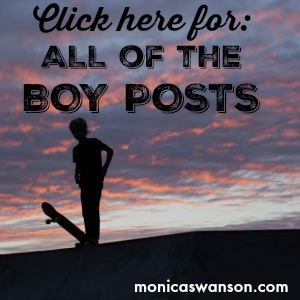 So happy to have found your blog. 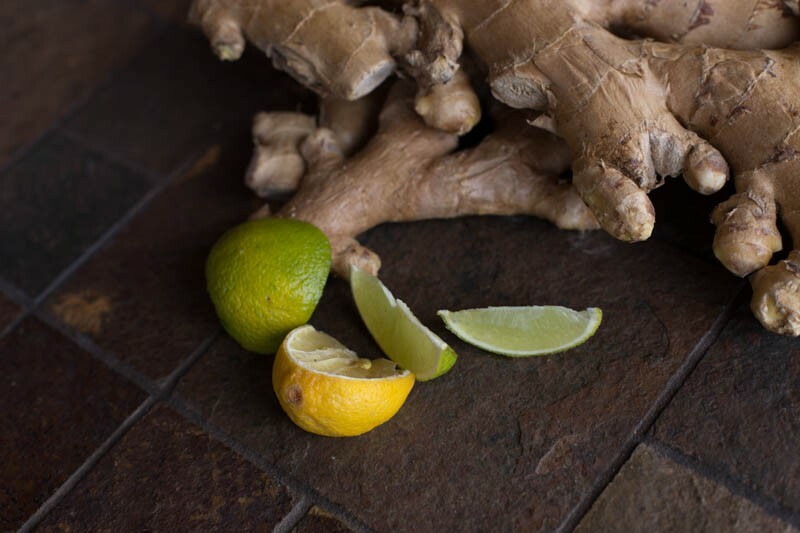 This ginger tonic sounds amazing! I love ginger. While I don’t have a juicer I do blend smoothies daily. Right now I’m enjoying my favorite green smoothie. Spinach, apples, cucumbers, frozen strawberries, water, half a lemon’s worth of juice and a tiny bit of stevia. So yummy! I’ll have to look into a juicer. Happy New Year and much aloha. Thank you Kim! Yum, I want one of what you’re having! 🙂 (breakfast time here now!) Of course you can put a small piece of ginger in the blender as well, (you might already do that,) but yes, juicing is fun in its own way! 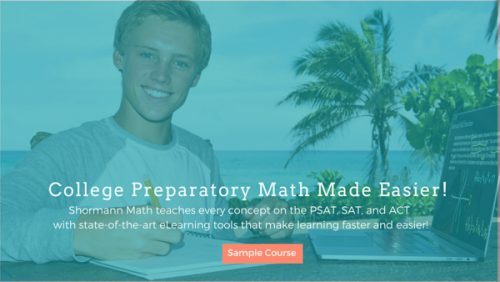 Aloha and thanks for commenting! I just wanted to follow up and let you know that I added some fresh ginger into my smoothie this morning and WOW! What an amazing flavor. I love it, this will become my new norm. Thanks so much for the suggestion. Have a great weekend! 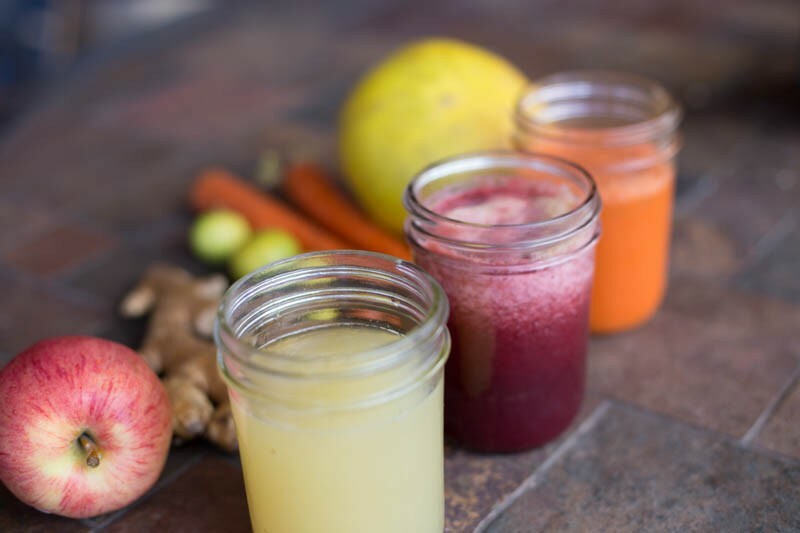 I had a juicer and just couldn’t do all the cleaning and stuff that came with it (plus the extra cost) but I DID love juicing ginger! It added so much flavor and heat to the juices, and I still crave it! This sounds heavenly! Thank you for sharing. So glad to hear from you Piilani! 🙂 What area of Washington do you live in?